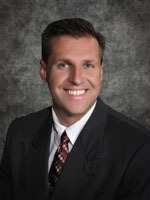 Nick Weis is a seasoned real estate veteran with almost 25 years’ experience. Nick is an accomplished professional serving tenants, landlords, buyers, and sellers of office and industrial space throughout Chicago’s East-West and South Suburban markets. Nick employs honest and sound negotiating skills, market savvy, and attention to detail while serving each of his clients. As an owner-operator of several real estate investments, Nick’s clients benefit from his valuable insight. Nick spent the early years of his career as a top-producing mortgage loan officer for several well-know banking institutions in the Aurora/Naperville/Joliet markets. Nick earned a BS in Finance from the University of St. Francis and an MBA from Northern Illinois University. Nick is a licensed real estate broker in the state of Illinois, a Certified Commercial Investment Member (CCIM), and a Certified International Property Specialist Designation (CIPS). Nick is married with five (5) children. He enjoys sports, fishing, boating, yard work, growing in his Catholic faith, investing, and giving back to worthy causes. Serving the Commercial Property Needs of Tenants, Landlords, and Investors since 1991. © 2019 Suburban Real Estate Services, Inc.
Sign up to receive our e-mails with the latest news and recently listed properties for lease.